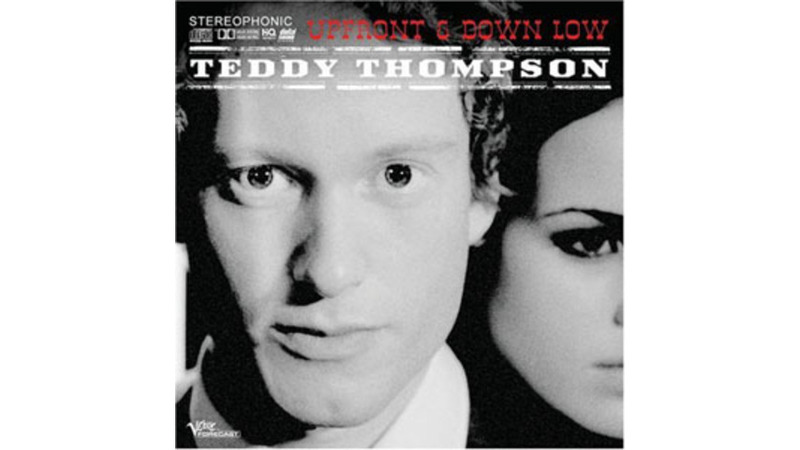 Teddy Thompson’s 2006 sophomore album, Separate Ways, fulfilled the promise of his debut, but what a harsh brew it offered. Amidst the dispiriting array of toxic songs, one particularly sour broadside stood out: the jaunty “That’s Enough Out of You,” wherein young Teddy observed, “I get tired / Just watching your jaw move / People that talk this much have nothing to say … Being happy is easy if you’re dumb.” Ouch. It must be scary going into the family business when your parents are Richard and Linda Thompson. The desperate intensity of Separate Ways suggested Thompson was trying too hard to match dad’s gallows humor. It seemed he was just one outburst away from needing an increase in medication. But, in his latest move, Thompson has deftly avoided a potential creative dead-end using a strategy often chosen by late-career artists struggling to stave off irrelevance: the covers album. Up Front and Down Low is dominated by vintage country tunes drawn primarily from 1940-1970, yet it’s no nostalgia trip. Searching to find the burning edge of Separate Ways in the words and melodies of others, Thompson has come up with a big surprise that stands out as his most compelling album to date. The seeds of Up Front & Down Low were planted in Separate Ways’ hidden track, a lilting rendering of the Felice and Boudleaux Bryant tune “Take a Message to Mary,” previously performed by the Everly Brothers. Thompson’s new album is bookended by versions of two more Everly tracks, “Change of Heart” (also composed by the Bryants), and another hidden cut, “Don’t Ask Me to Be Friends,” written by Brill Building mainstays Gerry Goffin and Jack Keller. (Sounds like somebody got his hands on an Everlys/Bear Family box set.) Both songs have a languid, melancholy elegance that’s more contemporary than retro; it’s easy to imagine one of today’s fashionably depressed bands aspiring to the same tragic beauty. Thompson, in contrast, lacks the deadly self-consciousness that makes so many of these high-minded artistes seem like overreaching pretenders. Instead, he’s got a wonderful, dark-hued voice, mournful yet lively and resonant, deeply passionate yet playful around the edges. Thompson’s no yodeler, although his emotions are so consuming that he often seems on the verge of bursting into a blue, Jimmie Rodgers-style wail. He’s Chris Isaak without the glibness; he’s Dwight Yoakam without the baggage of history and the distracting vocal tics. Not every song on Up Front reaches the same depths of pathetic abjection, though most ponder some aspect of love gone horribly wrong. While Thompson’s delicately sad rendition of Dolly Parton’s “My Blue Tears” does its writer proud (to the point of echoing her vocal inflections), “The Worst Is Yet to Come,” one of two Liz Anderson compositions, illuminates the limits of the “woe is me” approach—wallowing in misery to the point of self-parody. Thompson’s singing reveals a frisky streak that would make him a standout full-time rockabilly performer if he didn’t have grander aspirations. His brisk reading of Elvis Presley’s Sun Records classic “I’m Left, You’re Right, She’s Gone” is daring and delightful. Taking the song at a tempo similar to The King’s version, Thompson mixes snappy, vaguely Latin percussion and billowing strings to create something brand-new using familiar ingredients. This same respectful audacity resurfaces in covers of other standards nobody in their right mind would try to interpret. Thompson transforms Ernest Tubb’s “Walking the floor Over You” into an uneasy shuffle that avoids the campiness of the original and intensifies the song’s anguish. While he can’t bring anything new to George Jones’ “She Thinks I Still Care,” and while nobody could steal the honky-tonkin’ “Touching Home” away from Jerry Lee Lewis, at least Thompson displays excellent taste. The stellar supporting cast of Up Front includes guitarists Marc Ribot and dad Richard, Dobro/mandolin ace David Mansfield and pedal-steel master Greg Leisz, whose plaintive licks blend beautifully with the elegant string arrangements by Robert Kirby, of Nick Drake fame. (Buddy Rufus Wainwright also arranges strings on one song.) Among backing vocalists on the album are Tift Merritt, Jenni Muldaur and the sublime Iris DeMent, providing the tearful harmony on “My Heart Echoes.” It’s not an insult to any of these worthy contributors to point out that nobody usurps the spotlight. Thompson’s production is smooth and soothing, though never countrypolitan-bland, which adds a dash of honey to make the dire sentiments easier to digest. There’s one original song on the album, and it’s brutal enough to make you glad he concentrated on other people’s material this time. Proceeding at a tortured pace, the nearly six-minute “Down Low” finds Thompson apologizing to a mistreated lover, “You’d be better off dead / With a bullet in your head / Than to come back to me.” Here’s hoping he learns a little about subtlety from the great songs he’s covered before trying another album of his own material. While Thompson is an outstanding guitarist, makes the case for regarding him as a gifted vocal stylist first. Next time, perhaps he’d try tackling a set of Jimmy Webb or Joni Mitchell or Hank Williams songs. Thompson is so smart and charismatic that he’s sure to bring interesting perspectives to whatever he sings. But if he resumes plumbing his own warped psyche, brace yourself for the release of some pretty scary demons.